This weekend we made use of the competition prize I had won during the Royal Liverpool Philharmonic‘s most recent prize draw on Facebook. So David and I wrapped up warmly and made our way to the Suitcase Monument in Hope Street to embark on the Shiverpool Ghost Bus. It was a clear, yet windy night, perfect for haunting stories and ghostly apparitions. When we got to the monument there were already lots of people waiting for the bus which arrived a little late, (typical of the buses in Liverpool!) :p However it was nice to listen to the harmonious bells of both cathedrals, at opposite ends of Hope Street ringing into the dark evening as we stood waiting. In hindsight perhaps I should have booked a tour on a weekday as town on Saturday became busy with revellers and the roads chocked with traffic. 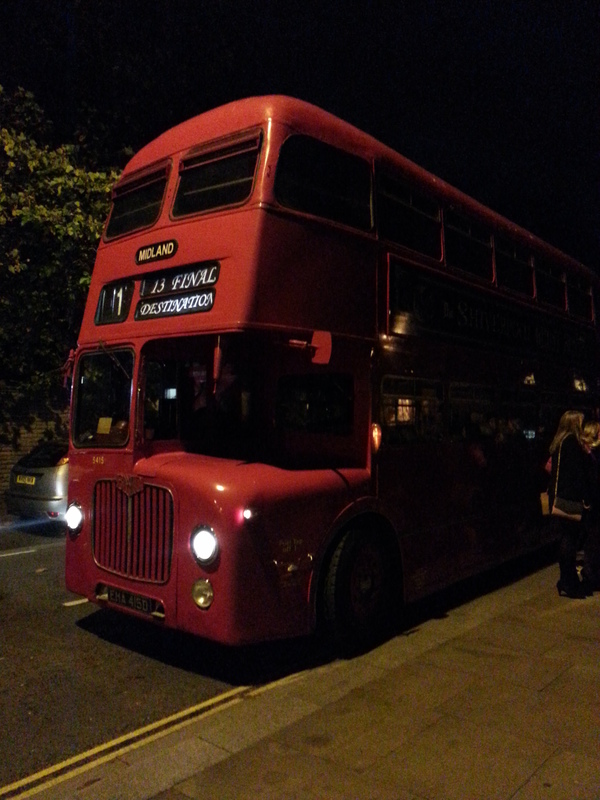 When the bus finally arrived it was a red double decker and looked impressive. Our tour guides for the evening were a duo of ‘brother and ‘sister,’ both lightly joked with the passengers who were all asked to go upstairs on the bus. This was by no mean feat with heels and an ankle length dress which I wore. The staircase was narrow and the steps uneven and in darkness was a bit of a safety hazard! The deck below was commandeered for a hen party from Ireland who held the tour up by 10 minutes! 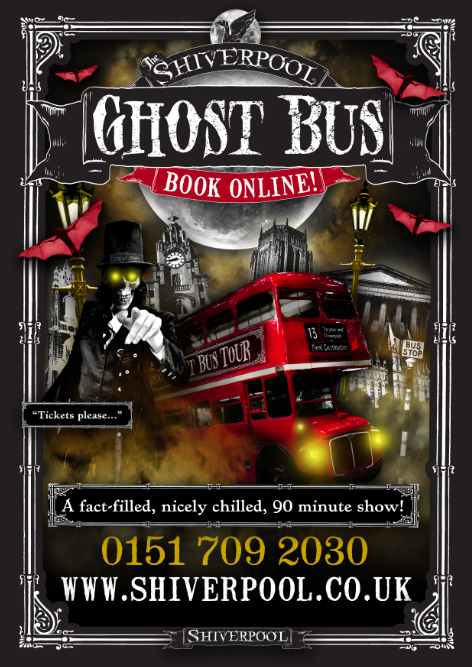 David and I have been on many ghost tours while holidaying in Edinburgh so the Shiverpool Ghost Bus had a lot to live up to! The tour took us around the beautiful Georgian Quarter of Liverpool, visiting Rodney and Huskisson Street. The guides spoke of George Huskisson who was the first person to be killed by a steam engine at the Edge Hill trials and unknown to me Huskisson Street was also the home of Florence Maybrick who was charged with the death of James Maybrick, A.K.A. of Jack the Ripper fame. The 90 minutes or so of the tour flew by and unfortunately the stories the guides narrated were rattled out at such a lightening speed that come to recap the experience, I am finding it hard to recall some of the tales. One such story, as we pulled alongside the leafy Falkner Square was about child murders and witches. The tour was punctuated by the appearance of ‘ghosts’ who seemingly had come to life as the stories were recounted. The first appeared while we were parked outside St Bride’s Church, off Catherine Street. It was of a young bride to be, who was buried alive in the grave yard. The actor was dressed in white with a veil covering her face. She silently walked around the bus before being scared away by the tour guides. The creepy part of these ‘apparitions’ was looking out of the back window to see them just standing on the pavement silently watching as the bus drove off! There was however a downside to having other actors joining us along the journey. This was, that while they were terrorising the passengers, as in the case of an angry drunkard tearing through the bus, you didn’t get to hear the story. So I missed a lot of the narrative due to this. One good thing that came from the tour was a greater appreciation of the city and it’s architecture. Liverpool is indeed beautiful! The bus drove past the Anglican Cathedral, the biggest in the UK, and took us along the waterfront to see the Albert Dock and the Three Graces all lit up! At one point in the tour we had to get off the bus. We all stood huddled together outside the iconic Royal Liver Building whose clock face is bigger than the Elizabeth Tower clock, ‘Big Ben‘. Here, outside the old insurance building, the guides told us a tale of poison and fraud. The silliest part of the night was when one of the guides got a gentleman to re-enact the symptoms of arsenic poisoning! Chronic diarrhoea and all!! However let’s not forget that the tour tickets were free and it was something different to do from the usual humdrum routine of a Saturday night. It’s just sad that the stories were really not that engaging, nor scary enough! We have been on better ghost tours!